I have written before on the questionable selection of the 850 MHz for use with 3G in Bhutan, instead of the more consumer-friendly 900 MHz which is used in India and other SE Asian countries. Recently, Kuensel reporter Gyaltshen K. Dorji ran a comprehensive story on this topic, An iffy 3G-frequency choice?, in which I was quoted. The government is giving 100 free electricity units to domestic consumers in rural areas. How many appliances can I use for free? I think you are right. No one explained what these energy units are and what they can be used for. Let’s take a look at how these units are computed. The story starts with watts. Each electrical appliance has a power rating in watts (named after the famous Scottish inventor James Watt). These ratings are printed on the appliance, often at the back. Watts are often abbreviated simply as W. You can find this number on any item that uses electricity, from light bulbs (ranging from around 20W to 100W) to boilers, water heaters and radiators, which are serious power hogs and can consume up to 3000W. The amount of energy that an appliance consumes depends on its power ratings and also on how long it’s been turned on. If a 40W power bulb is switched on for two hours, it consumes double the amount of energy compared to a 40W bulb switched on for one hour. To calculate the energy used, you simply multiply the power ratings (in watts) by the time the appliance is working (in hours). The resulting number is the amount of energy units, called - how surprising it that? - watt-hours. For example, say you have a 40W light bulb switched on for a total of 10 hours. It consumed 40W x 10 hours of energy, or 400 watt-hours. Often kilowatt-hours are used instead of watt-hours; one kilowatt-hour is 1000 watt-hours. Back to electricity units. Each month, domestic users in rural areas will receive 100 units of energy for free. Now here is the trick: Each unit is simply 1 kilowatt-hour (1000 watt-hours). For non-rural domestic users, by the way, the first 100 units are about Nu 1 each (and the next two hundred units are about Nu 2 each for both rural and non-rural consumers). Here are a few examples of typical usage. Let’s start with the ubiquitous mobile phone charger, which uses about 3W. If you charge your phone for two hours, it will use about six watt-hours, which are 0.006 units. If charged daily, this amounts to a total of 0.18 units of energy in a month. Another popular appliance is a rice cooker: A 600W rice cooker working for 20 minutes (⅓ of an hour) will consume 200 watt-hours, or 0.2 units per use. In contrast, a 1000W spiral heater working for 5 hours per day will use 5 units a day, or 150 units a month. To figure out the total units consumed by multiple appliances (mobile charging, rice cooker usage, etc.) simply add up the units. high levels of broadband use in schools were detrimental for grades on the ninth-grade national exams in Portugal. For the average broadband use in schools, grades reduced 0.78 of a standard deviation from 2005 to 2009. We also show that broadband has a negative impact on exam scores regardless of gender, subject, or school quality and that the way schools allow students to use the Internet affects their performance. In particular, students in schools that block access to websites such as YouTube perform relatively better. The paper was published in Management Science, a top research journal. It can be downloaded here for a fee. Alternatively, you can download the free working paper. What about broadband for schools in Bhutan? Follow the discussion or leave a comment on the Sherig Collection thread (registration required). Our post with tips on Transit to/from Bhutan via Delhi airport has attracted quite a bit of attention. 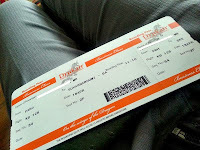 We've just learned of a new possibility to avoid waiting in the transit area at Delhi airport, and obtaining the Druk Air boarding pass even when the Druk Air counter is closed. According to a recent announcement by the Association of Bhutanese Tour Operators, passengers can email their details (passenger name, flight number and flight time) to delkkkb@drukair.com.bt and anshu.c@drukair.com.bt. Once you reach Delhi, the boarding pass should be waiting at the transit desk, allowing you to go into the gates (and lounge) area. We haven't tested this solution - if you have, please share your experience. Now, we only hope that this service is extended to transit in Bangkok, where the Druk Air counter opens only 2.5 hours prior to the flight. Obtaining the boarding pass earlier would be helpful to business class passengers with a long layover in Bangkok, who currently cannot use the lounge access until the Druk Air counter opens. Following up on a previous post on website hacking (and a bunch of related posts on Internet security) it appears that the different IT departments could use some help in detecting hacks. Business idea #2 is therefore a "hack detection service". The service carefully examines websites of subscribers on a daily basis. If hacking is found, the subscriber is immediately notified. Determining the pricing will require considering operation costs such as Internet fees and salaries. Getting subscribers might require offering a free trial period and publicizing the service at different IT departments. A few free trial periods can then be used to show the value of the service. Disclaimer: Our ideas are just ideas, not necessarily sound business advice. If this business already exists in Thimphu and we missed it, please let us know! Before rushing to implement the idea, do some research about costs. Create a spreadsheet with the costs and see how much you will need to earn to break even and to make a profit. See if you can survive for a year with no profit and perhaps loss, until the business is more established. The best approach is to consult with organizations that help local entrepreneurs such as the Loden Foundation (see their upcoming crash course on Apr 16-17) or the Youth Development Fund. Will my unlocked iPhone 5 support 4G in Bhutan? Bhutan Telecom recently launched their 4G service in Thimphu. 4G, also known as LTE, promises speeds faster than 3G and fixed-line broadband. Different LTE networks around the world use different frequencies, also known as bands. The trick is that your phone must support the network’s frequency in order to be able to connect to it. The frequency that will be used by Bhutan Telecom’s 4G network is 1800 MHz, also known as “band 3”. This is the 4G band used in most of Asia, Africa, Europe, and Oceania. Picking this band was a wise decision: 4G phones and data cards that are available in the Indian market - Bhutan’s main trading partner and the source of most phones in mobile shops in Bhutan - will work here. But it also means that 4G phones for the north American networks (which do not use band 3), will not necessarily work in Bhutan (or in other networks in SE Asia, for that matter). Even if you own the iPhone 5 model A1428 which does not support 4G in Bhutan, I wouldn’t worry about it too much. Firstly, 4G is only available in selected parts of Thimphu, and you wouldn’t be able to use it outside Thimphu anyway. Secondly, for most purposes - casual browsing, email, etc. - 3G is good enough, and you don’t really need 4G. Thirdly, Bhutan Telecom’s 4G network does not currently support voice or SMS, so even if your phone connects to 4G, you will not be able to make and receive phone calls or use texting. Can I assume you wouldn’t like that? Lastly, by the time 4G supports voice and the network is available nationally, there’s a good chance that you will have moved on from your iPhone 5 to a shiny new device. Where is the job description la? Remarkably, vacancy announcements by local organisations in Bhutan will always include the title and required qualifications, but never the job description. This is true for all sectors - government, corporate, and private - and for all job types at all levels. The only announcements that do include job descriptions are for posts funded by international organisations. Here are a few examples. The last announcement (by BCCI) does have a job description; the project is funded by the European Commission. Tens of Druknet-hosted websites are currently down, most likely due to a faulty database server. These include Bhutan Chamber of Commerce, BICMA, Bhutan National Bank, eDruk, Mangdechhu Hydroelectric Project Authority, NCWC, Office of the Attorney General, Royal Education Council, Government to Citizen Initiative, and many others. Planning to buy a phone soon? Watch out. 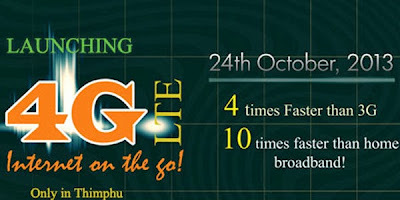 Many of the 3G phones sold today in Bhutan can only be used as 2G phones. Why? Most phones sold in Bhutan are imported from India, where the 3G frequencies are 900/2100. However, the frequencies used in Bhutan are 850/2100. This is unfortunate. Many of the smartphones imported from India only support 3G at 900/2100. These phones will not be able to use 3G in locations where 850 is used, such as Thimphu, Bajo, and more. In addition, TashiCell's 3G network is also using 850, and so these phones will not be able to take advantage of this upcoming alternative to B-Mobile's 3G network. Here is a photo I took today of a typical display window in a mobile shop in Thimphu. Here are the 3G specifications of these phones. All the 3G smartphones in the above photo do not support 850. If you plan to use them to connect to the Internet, you are wasting your money. A similar situation exists in other shops in Thimphu. 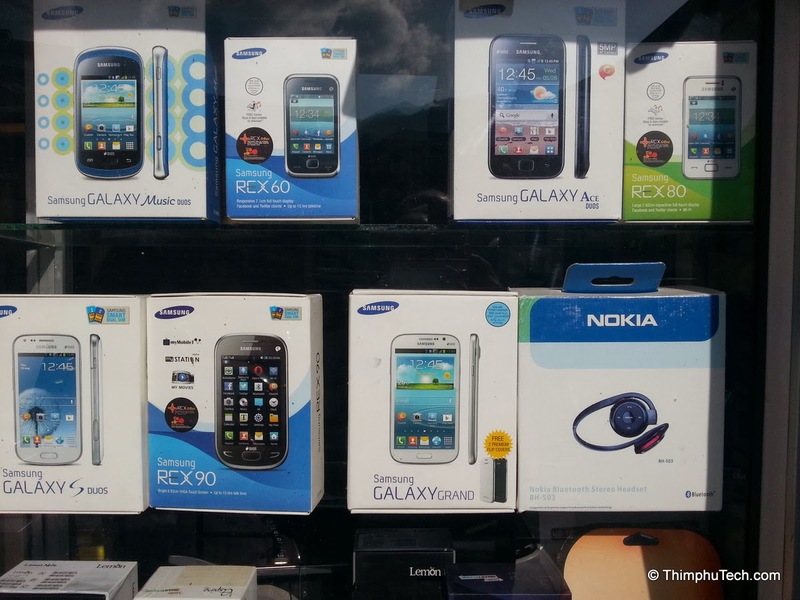 Shops are packed with 3G phones that will not work in Thimphu. You will need to search carefully and make sure that the phone you buy supports 3G at 850. They are not easy to find: the selection is relatively poor, and their prices are high. Does the Samsung Galaxy Grand support 3G? Following my last K2 column, I got a lot of queries regarding the highly-rated, relatively affordable Samsumg Galaxy Grand smartphone: Will it support 3G in Bhutan? Looking carefully, one sees two different specs for the 3G network bands: the first line shows 850/1900/2100, the second has 900/1900/2100. From the research I've done, the reason is simple: Samsung has released two Galaxy Grand variants. One version is mainly for the Asian & European market (900/1900/2100) market, the other mainly for the US market (850/1900/2100). The bands used for 3G in Bhutan are 850 and 2100. While all 3G phones sold in India support 2100, most of these phones do not support 850, as India uses 900 and 2100. 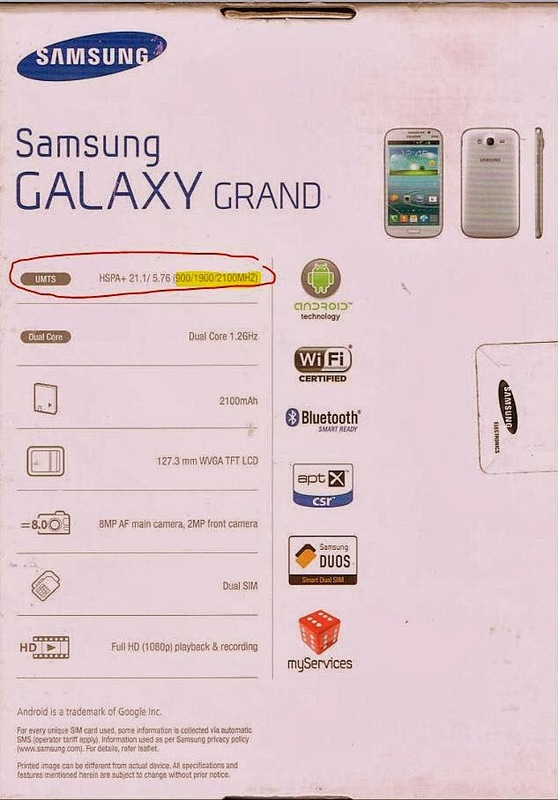 If you got your Galaxy Grand in India, it will NOT support 850 3G in Bhutan. The phone's packaging will show the exact bands supported, as you can see below. In this case, the phone supports 900, but not 850 - so it will NOT support 3G in Thimphu and and a few other locations in Bhutan. Will the new Micromax Canvas 4 phone support 3G in Thimphu? but no 3G in Thimphu for you! Had you asked me this question a year ago, my answer would have been an earsplitting “yes”. But today, surprisingly, the answer is a painful “no”. Let’s see why. As people cannot even reach a consensus on paper size (A4 vs. Letter), it won’t come as a complete shock that four different 3G bands are used around the world. The most popular is 2100 MHz. The other three are 1900, 900, and 850 MHz. Most phones support the popular 2100 band, and often support one or more of the other three. Once upon a time in the Kingdom, the only band used for 3G was 2100, and this meant that 3G phones as well as 3G data cards (and their owners) were kept happy. Then, in November 2012, Bhutan Telecom decided to change the band used for 3G in Thimphu to 850. This was done to improve reception in urban areas (the lower the frequency, the better the signal penetrates buildings). But it also meant that many existing phones and data cards that did not support the 850 band were suddenly rendered useless, and their owners became quite unhappy. I found this move baffling, as telecoms and other utility companies are commonly required – and usually make a special effort – to ensure that their upgraded systems will be compatible with existing equipment used by customers. Imagine BPC suddenly changing the voltage to 110V! In the case of Bhutan Telecom, they could have perhaps kept the old band (2100) alongside the new one (850) in order to ensure that their users’ investment will not be lost. But all that is ancient history. Currently, Thimphu (as well as Bajothang, according to a BT representative) use the 850 band, while other locations in the country that support 3G use the 2100 band. Oops! 3G on the Micromax Canvas 4 can only operate on 2100. To check whether a phone will support 3G in Thimphu, you need to verify that it supports the 3G 850 band (this is different from the 2G 850 band). You can look for the information on the phone manufacturer’s website. Or use gsmarena.com, a very popular phone comparison website: Select the phone manufacturer on the left bar. Then, click on your desired phone and see whether the 850 band appears under “3G Network”. As you can see in the attached screenshot, the Canvas 4 supports 2100, but not 850. Thus, the Canvas 4 will work in many 3G locations, but not in Thimphu. Unfortunately for Micromax, TashiCell’s upcoming 3G network will also be using the 850 band, and thus the fate of the Canvas 4 phone in Bhutan has been sealed. "And I have promises to keep..."
B-Mobile is launching LTE tomorrow, October 24. LTE is a fourth-generation (4G) mobile broadband technology. 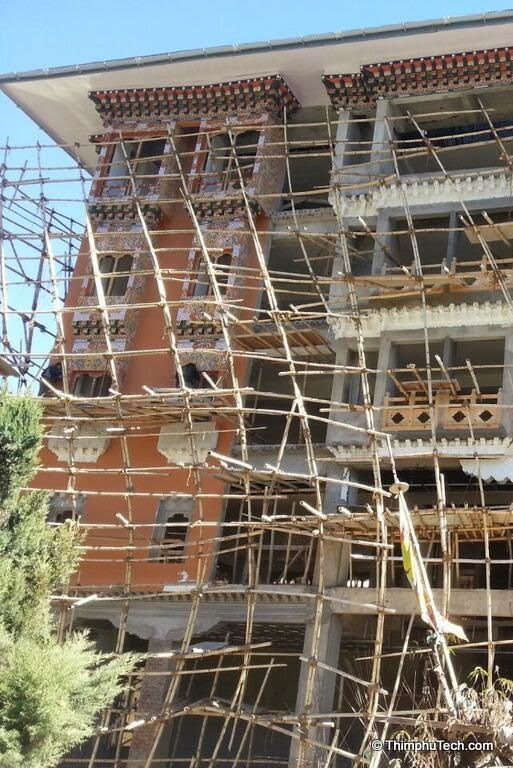 According to the launch announcement, it will be available in selected parts of Thimphu (Ministers' Enclave, Dzong, Norzin Lam, and a few other areas). To use LTE, you will need a mobile handset (or data card) that supports the new technology. While keeping up with the latest technologies is nifty, a few issues related to this new launch come to mind. So what speed is LTE in Bhutan going to support? Your guess is as good as mine. In any case, this is only the theoretical maximum speed. What the actual speed will be is anyone's guess. For example, the 3G download speed mentioned on BT's website is a cool 21 Mbps. I have never been able to come even close to that speed. BT's LTE is expensive for customers. First, you will need a special LTE SIM, which is Nu 500. Granted, this includes Nu 500 worth of data, which you'll have to use within a week. It's not clear why you need to hurry up and use that data so quickly. Over and above the one-time SIM investment, there is of course the recurring cost of data. The price per KB for LTE is Nu 0.001, which translates into Nu 1048/GB. That's "10 times more expensive than home broadband, and 3 times more expensive than 3G!". Compare that to LTE in India, which costs the same as 3G, and as little as Rs 50/GB. More troubling is the question of payment when your LTE phone is out of the LTE coverage zones, and then falls back to using 3G, or even worse, EDGE or GPRS. Do you still pay the subscription prepaid rate of Nu 1048/GB, or will you be charged according to the much cheaper 3G tariff? In other words, does BT keep a separate account for data usage for each of the technologies? This is not clear and I could not find any information about this issue on the website. About a year ago, B-Mobile switched the frequency of 3G in Thimphu from 2100 MHz to 850 MHz, as the lower frequency offers better reception in buildings. In general, frequencies in the 2000 MHz range cannot penetrate buildings very well. The new LTE band to be used in Thimphu is 1800 MHz, which is again not optimal for urban areas. LTE can also support lower frequencies such as 700, 800, 850 and 900 MHz, which offer superior reception in buildings. I am not sure why LTE in Thimphu will be using the higher frequency of 1800 MHz; there might be a hidden technical issue that I'm not aware of. 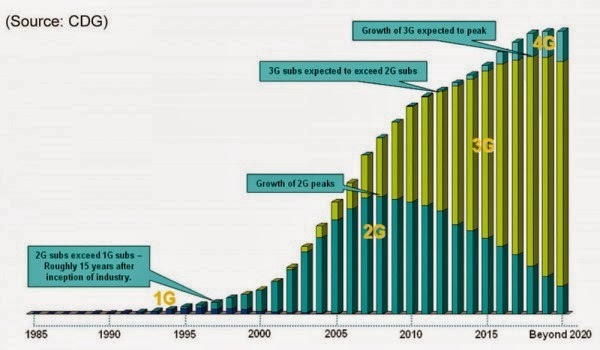 Otherwise, should we expect another change of frequency, as was the case with 3G? LTE requires LTE-compatible handsets that support this standard. They tend to be expensive, and not easy to procure, especially in India. My guesstimate is that at least 99% of smartphones in Bhutan do not support LTE. For example, the popular Samsung Galaxy S III (GT-I9300) does not support LTE (contrary to what's mentioned in the Kuensel article). The Samsung S III LTE, which is a different variant (GT-I9305), does support LTE, but it is generally not available for purchase in India. Another example is the iPhone 5. The iPhone 5's US/Canada edition (A1428) does support LTE, but not the 1800 band, so this phone will not be able to use 4G in Bhutan. Aside from all these issues, the key question is: why now? Who will benefit from the deployment of LTE at this point in time? LTE is a new technology. Although it has various advantages compared to 3G (and will eventually supercede it), many of these benefits do not play off in Bhutan. For example, LTE offers better handling of fast-moving mobile phones (up to 500 km/hour). I don't see that as a useful feature in Bhutan until we get our first bullet train. It also offers advantages in highly-congested metropolitan areas. Again, not very applicable for Bhutanese towns. In contrast, 3G and its 3.5G derivatives, such as HSPA and HSPA+ (with a theoretical download speed of up to 168 Mbps) are mature technologies which are backward-compatible with 2G. 3G uses cheaper telecom equipment, cheaper handsets, and when deployed correctly, can provide adequate mobile broadband for Bhutan's needs in the foreseeable future. Twitter in Bhutan is growing. Check out the following chart, which shows the change in the number of followers for some of Bhutan's most popular Twitter accounts. Order is alphabetical. Note: hover your mouse over a user to compare the number of followers in the last 12 months. Lately, many people I talk to have been complaining about deteriorating broadband speed. Some have even said that they often find 3G faster than broadband! My broadband connection at home too has been giving me trouble this weekend; it's not the first time that it has slowed down to an almost complete halt. Calling the support line at 1600 has proven to be futile, as the representative has insufficient technical knowledge and the blame is often put at the customers' equipment ("try to reboot the computer"). So, I decided to check what's going on. My home is shown in the first line (192.168.1.1), and www.druknet.bt is the 4th and last line (202.144.133.45). In between are two intermediate hosts that forward the information to the final destination. The host my home is directly connected to is shown on the second line, 202.144.159.15, and is a DrukNet router. The ping utility shows a serious problem. The round-trip time - which is supposed to be less than 50ms, shows numbers ranging from 23ms (good) to 3808ms, which is almost 4 seconds. That's unreasonable. That's more time than is needed for an Internet packet to travel to the moon and back. The 4% error loss to the nearby is also an indicator of serious trouble. My guess: Someone at DrukNet reset the faulty equipment. From my experience, this behaviour will repeat itself occasionally until DrukNet cuts to the bottom of the problem. If you share a similar experience, kindly post your comment. I just noticed that I made a mistake in a Facebook status that I wrote. Can I fix it or is it there forever? You’re in luck! Up until recently, there was no way to edit posts. 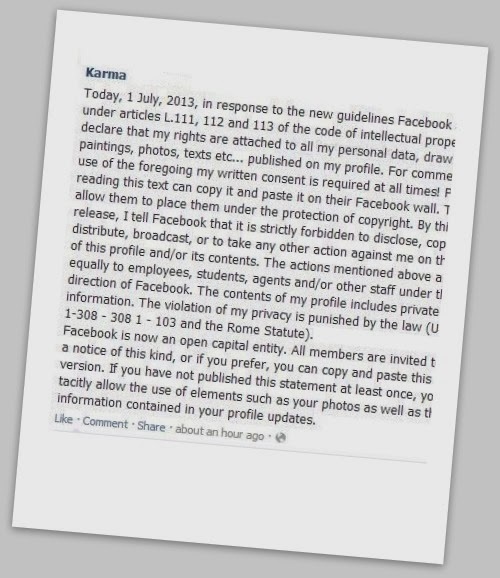 While comments to a post could be edited, Facebook did not allow editing the posts themselves. So once you updated your status, there was no way to fix any errors or add information to your status. The only way out of a mistake would be to delete a post, but that would also delete all the witty comments and all those precious “likes” that your post accumulated. Users therefore often decided to keep the post and live with the embarrassment. A couple of weeks ago, however, Facebook made the change that many users have been waiting for. You can now edit any post, from the browser or from the Facebook app on Android. The Facebook app for iOS will have this feature “soon”. Your guess about “soon” is as good as mine. Similarly, from the Android app, click on the small arrow at the top-right side of the post, then select ‘Edit Post’. Make your desired change, then click on ‘Save’. That’s it. 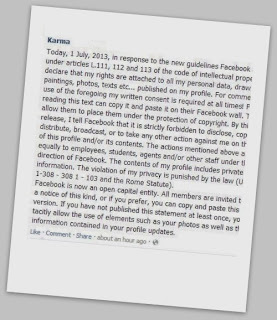 Some users fear that editing a post can cause trouble. For example, say you leave a comment on a post that your friend wrote. Later, your friend edits the original post in a way that makes your comment look irrelevant, or even foolish. Still, the advantages are probably worth that risk. Or at least, Facebook seems to think so. When you design a website, think about your visitors and how they going to use your website. Too often, webmasters do not put themselves in the position of the people who are going to use their websites. Here's an example. The BBS website has two editions: English and Dzongkha. Toward the top of each page there are two links that allow you to switch editions. Say a visitor speaks only English, but happens to land on a Dzongkha news page. Where does she click to escape into the English site? Everything's in Dzongkha, even the link to the English edition. That's not a good idea. Uh? What do I click now? Here is a more usable version. Notice the difference? The same issue also exists in the English version. There's a link to the Dzongkha edition, but it's in English. My class VIII daughter wants to use my Windows 7 laptop to do research for a school project. How do I make sure she doesn’t mess with my own files and programs? Sharing a Windows computer with others is risky if everyone is using the same account. By sharing a single account, users can accidentally (or maliciously) delete, copy, add or change files, settings or programs. Not good, and unfortunately a popular practice! The solution is simple: create an account for each user. This will make sure each person’s work doesn’t interfere with another’s. To create a new account for your daughter, first click on the Start button, then open the Control Panel. Make sure items are viewed by Category. Now select Add or remove user accounts under User Accounts and Family Safety. You will see a list of all the existing accounts, as well as an option to Create a new account. Click that option, enter an account name (it can be your daughter’s name), select “Standard user” to make sure she cannot mess around too much with your computer, and finally click Create Account. A new account for her will be created. It’s also a good idea to protect her account with a password. Simply click on the account name, select Create a password, and then follow the instructions. In case you haven’t done so already, make sure to password-protect your own account as well. Don’t forget your password! From now on, when you start Windows, you will be asked to choose an account. Remember to log off before your daughter starts working on the computer. A small tip: there’s a built in Guest account in Windows. This is convenient if a friend wants to temporarily use your computer. The Guest account is turned off by default. To turn it on, simply find the Guest account in the list of accounts, then select Turn On. From now on when someone wants to use your computer, let them log in using the Guest account. If you’ve been on Facebook recently, there’s a good chance you ran into the “Just 14 years Old drunk girl did this infront of all Public” [sic] post. Naturally, some users are tempted to click on the link, and if they keep following the instructions, malicious software will eventually be installed on their computer. Among other things, the malicious software might steal your private information, and it will also post identical messages using your Facebook account. That’s how this virus is spread. To avoid this trouble, don’t click on dubious links, and if you click by mistake, don’t follow instructions that ask you to install suspicious software or browser extensions. 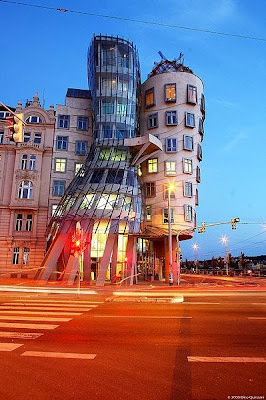 Fodor's is one of the world's largest travel guide publishers, and they also run a very popular travel website. 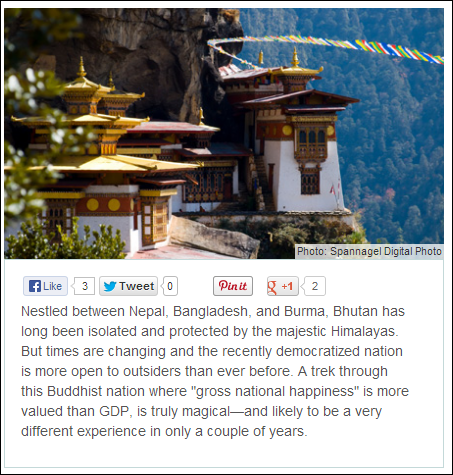 On their Bhutan page, the Kingdom's geographical location is given as "nestled between Nepal, Bangladesh, and Burma". I am not sure why, but two other rather significant countries are omitted from this description. My Samsung Galaxy phone runs out of battery pretty quickly. What can I do? The most popular grievance about smartphones is their abysmal battery life, and justly so. Most need to be plugged into a power socket at least daily. So what to do? First, note that it’s the bright and shiny display that sips up most of the juice, so turning down the brightness will get you major energy savings. Also, make sure the display turns off as quickly as possible after using the phone (there’s a setting for that). You can also turn off hardware that you don’t use, such as Bluetooth, GPS or mobile data, as well as many of the apps that run in the background. If all this sounds like too much of maintenance, you’re right. Luckily, there are apps that can help maximize the battery life automatically. For android, try “Easy Battery Saver” (search in the Google Play Store, or visit goo.gl/QypmuQ). One common misconception is that it’s better to wait until the battery is depleted before recharging the phone. 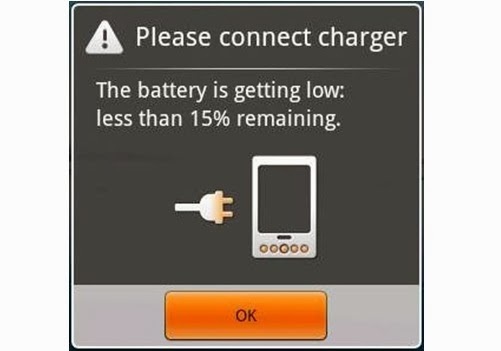 This is not true for the type of batteries used in today’s phones. So connect your phone to the charger whenever you have the opportunity. So is this what technology is all about? This hassle and others remind us that instead of smartphones serving us and making our lives simpler, we now have to serve them! We should therefore think carefully how, when, and whether smartphones are improving our lives and when they become a major burden or an unwanted distraction. Can’t bear the thought of your smartphone running out of battery? You probably suffer from nomophobia - the fear of not having access to a working mobile phone. Other symptoms of this modern phobia (which got its name from NO MObile) are the fear of losing your phone, running out of balance, or being in an area with no network coverage. If any of the above rings a bell (or your connected phone) - you’re in good company. While there are no statistics about Bhutan, a survey done in the UK shows that more than half of the British mobile users are nomophobics. How can I use online marketing to promote my services? Online marketing is indeed a powerful tool. Let’s start with the obvious: Facebook. The world’s largest social network is very popular in Bhutan – there are around 118,000 accounts in the Kingdom – and so a free Facebook page for your new venture is a natural place to start your experiments with online marketing. Go to www.facebook.com/pages/create and follow the instructions. Add your business information, then invite your friends to “Like” the page. Make sure that you regularly update the page with relevant photos and new posts – a stale page is as attractive as a dusty display window. You can also experiment with Twitter (twitter.com). Although the number of tweeple (Twitter people) in Bhutan is still relatively small, many of them are social influencers and can help spread the word. Linking your two accounts (Facebook and Twitter) will make sure that Facebook posts also appear on Twitter, saving you work (facebook.com/twitter). If you have earmarked some real money for marketing – and have access to an international credit or debit card – you can increase your visibility using online ads. Facebook advertising (facebook.com/advertising) is one popular option. People see these ads when they use Facebook. You can target a specific audience, for example Bhutanese users (in case your business is for the local market) or any other country or countries (for example, if you are a tour operator). Another popular option is Google Ads, which appear when people search for information on Google, but they are more complicated to set up (google.com/adwords). Barring international payment cards, your best bet is advertising on popular local websites, such as KuenselOnline.com or thebhutanese.bt. Lastly, here are a few more tools to consider. Mass email and online forums can be helpful, but use with care, as spamming will create a negative effect. Online surveys (surveymonkey.com) are a low-cost way of conducting market research before launching your business. And while not exactly “online” marketing, taking advantage of B-Mobile’s Cell Broadcast Service can help your message reach the 80% who are not online. A small ad by the Bhutan Education City Board in the Kuensel caught my eye. Or rather, the website that was mentioned in the ad is what caught my eye. Since Education City is a Bhutanese project, one would expect the top-level-domain for the website to be .bt. 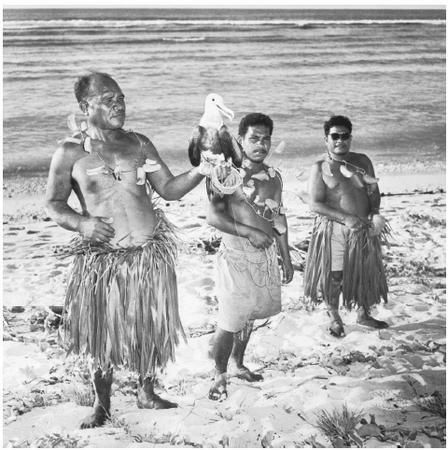 However, the website, www.becboard.co.nr, has a top-level domain of .nr, which belongs to a tiny island in the South Pacific: The Republic of Nauru, one of the world's smallest independent republics. In case you are wondering: no, there are no plans to establish an Education City in Nauru (area: 20 sq km; population: 10,000). The reason BEC chose to use the domain is probably cost: .co.nr domains are free. The website itself is hosted by another free service, 5gbfree.com. While cost-cutting is a commendable goal, organizations should pay attention to the top-level domain (TLD). Using a domain listed in a different country sends a confusing message, both to humans and search engines such as Google. In the case of BEC, one would expect their site to be using a domain such as bec.bt, becboard.bt, bec.edu.bt or even becboard.org. When I copied some text from Microsoft Word and pasted it into a Gmail message, the message got all messed up. Is there a better way to copy-paste text? Thanks, this is a great question that has probably crossed the minds of many of us. So why does the text get “messed up”? When you copy content from one application to another, it’s not only the pure text that is being copied. The formatting of the text is also copied. What’s formatting? Glad you asked! Formatting includes the different fonts, font sizes, colors, and other cosmetic information that influence the makeup of the text. If the content includes tables or images, these are often included as well. Now that we understand what was copied when you clicked Copy, let’s move to the pasting stage... 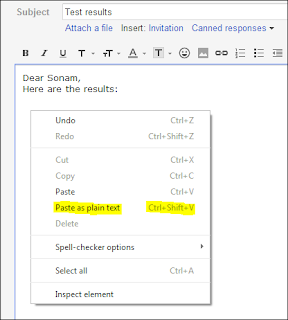 When you paste the content into the Gmail compose box (or any other application, for that matter), all that formatting can often wreak havoc in your message. You often want to copy just the plain text to the destination application. Luckily, there is an easy trick. 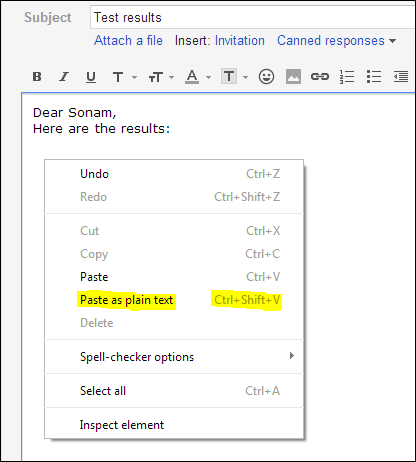 Instead of a normal Paste, you can use the Paste as plain text option. This will paste just the text without all the excess baggage. This nifty option usually appears just below the normal Paste option (see figure). You can also use the Ctrl+Shift+V shortcut to achieve the exact same effect (hold the CTRL and SHIFT keys while clicking on the letter V). In early June I wrote about the obscure pricing scheme of DrukNet’s new broadband plans. Good news: Druknet listened and corrected their pricing. Now, the more expensive the package, the cheaper the cost per GB. Huray! Two months ago we wrote about DrukNet's awkward pricing of the new broadband packages (See The Updated Broadband Packages: Strange Pricing). As a response to our complaints, DrukNet have now fixed the issue. They have increased the data quota of the Office package from 12 GB to 16 GB, and the Enterprise package from 24 GB to 27 GB. The cost per GB is now cheaper for the more expensive packages. Druknet general manager, Tshering Norbu, said that the latest revisions were in response to customer feedback. “We had to revise the data quota allotment of the packages after customers’ request to incentivise higher packages more than the lower packages, by providing the former at lower tariff in terms of cost per MB,” he said. (Kuensel, Further drop in internet package prices, July 19, 2013). We are glad to see that the issue is now resolved. My son is left-handed. Is there a special mouse for left-handed people? Various surveys show that about 10% of the world population is left-handed. If the same percentage holds for Bhutan (and that needs to be verified), then there are more than half a lakh left-handed people in Bhutan. That’s a lot! Living a left-handed life can be challenging: Have you ever tried using ordinary scissors - the ones designed for right-handed people - with your left-hand? It’s not easy! What about playing the guitar? Switch your guitar to the other hand, and suddenly the strings are in the reverse order. There are even special pencil-sharpeners for the left-handed. Luckily, there is no need for a special mouse for left-handed people. There are two buttons on the mouse. The primary button, which is usually the left button, is used for clicking items and selecting them, as well as for dragging-and-dropping items. Right-handed people use the index finger to operate this button. The other button is called the secondary button, and is usually the right button on the mouse. The secondary button opens a menu of various operations you can perform on the item you clicked on, for example, renaming a file. To set an ordinary mouse for left-handed users, the primary and secondary buttons need to be switched, so that the primary button can be operated with the index finger of the left hand. First, open the Control Panel. Next, click on the Mouse icon (if you cannot find the Mouse icon, you are probably in the Category view - just switch to the Icon view first) . Under the Buttons tab, select the “Switch primary and secondary buttons”. The buttons are now switched! Are you using your laptop’s touchpad? The touchpad can be difficult and frustrating to operate. Here’s a better option: get a small USB mouse, connect it to your laptop, and use it instead of the touchpad. If you use your laptop for long hours, it will reduce the stress on your eyes as well as your hand. I noticed that DrukNet has new prepaid broadband plans. Which one should I choose? 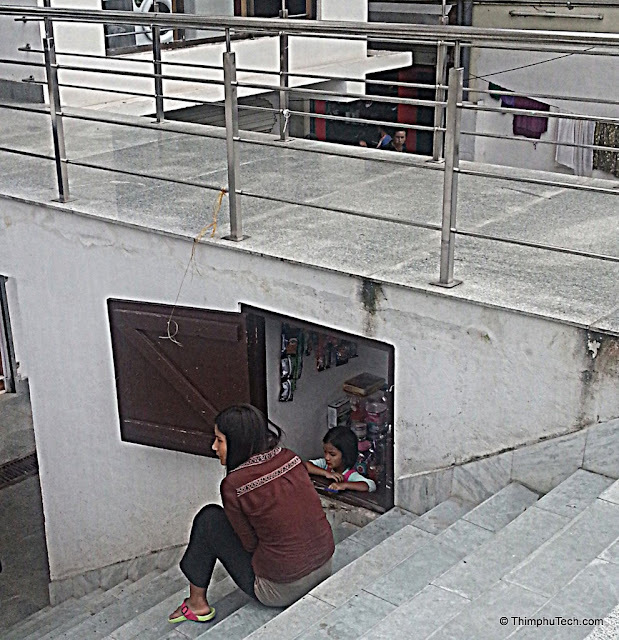 The cost of Internet access in Bhutan keeps dropping, and the speed keeps increasing. The net effect: Consumers are getting more for their money. Let’s take a short walk down memory lane: five years ago the cheapest monthly broadband package, called “DSL-1000”, was priced at a Nu 1000 and included a meager 0.5 GB of data at a crawling speed of 0.25 Mbps. With today’s cheapest package (the “Home” at Nu 400) we get eight times the amount of data (4 GB) and a maximum download speed of 2 Mbps. Not bad, but we’re still behind other countries. According to the NetIndex’s Household Download Index, Bhutan ranks #179 out of 184 countries, so there’s still room for improvement. However, compared to just a few years ago, this is a major upgrade. DrukNet offers both prepaid and postpaid plans. The postpaid packages are substantially more expensive compared to the prepaid ones, so avoid them if you can. Let’s focus on the prepaid plans. There are currently three prepaid packages: Home, Office, and Enterprise. All of them offer the same speed (up to 2 Mbps) and the same expiration period (30 days). The only difference between the three plans is their cost and the amount of included data. As seen in the table, the Home package offers the best rate at only Nu 100 per GB. The other two packages (Office and Enterprise) are more expensive, and I couldn't find any good reason to use them. With the expensive packages you pay more per GB. In addition, you are also at risk of wasting a lot of money if you forget to recharge before expiration. If you are a heavy broadband user and are thinking of recharging using an expensive package to save multiple trips to the BT office, here’s a better alternative. Just ask the BT representative to recharge multiple times using the Home package. For example, if you need 12 GB, simply ask to recharge using the Home package (400 Nu), but three times in a row. You will end up paying only Nu 1200 for 12 GB. This is Nu 300 cheaper than recharging with the 12 GB Office package. Why does DrukNet offer the Office and Enterprise packages? If you find out, please let me know. 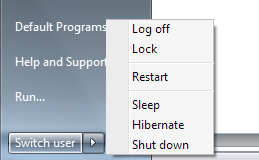 When I turn off my Windows laptop, I noticed options for Sleep and Hibernate. What is the difference between the two? Shut down, sleep, hibernate... Let’s try and sort things out. We’ll start with the most familiar option: Shut down. When you shut down your laptop, all your applications close, and then the laptop turns off. In this “off” state, the laptop uses no power, so the battery can keep for days. When it’s time to use the laptop again and you power on the laptop, Windows restarts (which can take a minute or two – or five) and then you need to re-launch your applications, like MS Word or your Internet browser. Now let’s talk about sleep. In sleep mode the computer starts dreaming. OK, just kidding. In sleep mode (previously known as Standby), the screen and other power-hungry parts such as the hard disk are turned off, but the computer’s memory — where the running applications are kept — is still powered. This allows the computer to wake up very quickly – usually in a matter of seconds – and snap back to where you left it off, applications and all. In sleep mode, the computer uses little power but it still slowly drains the battery. If you are not using your computer for a few hours, or if the laptop is plugged into power, this is usually a good choice. Finally: Hibernation. Somewhat like hibernating bears (but not all of them – sloth bears do not hibernate! ), this is similar to a deep sleep. Hibernating the computer and waking up from hibernation takes longer than putting it to sleep and waking it from sleep, but when it wakes up, eventually it restores to where you left off. Why use hibernation? Under hibernate mode, the battery can keep for days. Here’s how it works: When you hibernate your computer, the content of the memory – where the running applications are kept – is first saved to the hard disk, and then the computer shuts down, so the laptop uses no power. When you turn the computer on, it restores the memory back from the hard disk. This is why waking up from hibernation takes longer than waking up from sleep. Hibernate mode is useful if you know your computer will be disconnected from power for a day or more, but you still want to kick off exactly where you left off. If you pull out the power cord or otherwise turn off the power while Windows is still running, this may result in corrupted files and other unexpected trouble. It is best to first shut down Windows, then turn off the power to the computer. This inforgraphic was published in today's Kuensel (TV’s stand-alone influence on society). If one person equals 2%, and two people equal 4%, how many people equal 38%? Fantastic news! As reported in the Kuensel a few days ago, Bhutan Telecom has reduced the price of its broadband packages by about 40%. In addition, all broadband users have been upgraded to the maximum circuit speed of 2 Mbps (actual download speed is often much less). Since that the package you choose does not affect speed or validity, the main factor when choosing a prepaid package should be the cost per GB . So which one should you choose? Let's look at the table. The Cost per GB is displayed in the last column. One would expect to get a discount when recharging with a more expensive package — or at least not to get penalized for higher recharge amounts. Surprise! Compared to the cheapest package (Home), when you recharge with the Office package, you pay 25% more per GB! The most expensive package (Enterprise) package, is cheaper than the Office but still more expensive than the Home. What might be the explanation for such an unusual pricing scheme? TashiCell customers can now tweet (and receive tweets) using SMS. This was announced by Twitter about a week ago. Curiously, I could not find any mention of the new feature on T-Cell's website. To begin, text START to 40404. B-Mobile used to offer an identical service, but it was not working - without any explanation - for a few months. Today it started working again. Coincidence? I want to upload a snapshot of my laptop screen to my website. How can I create the snapshot and turn it into an image? Well, one foolproof way — though undesirable — is to stand with a digital camera in front of the screen and take a snap... Luckily, there are neater ways to take a screenshot. 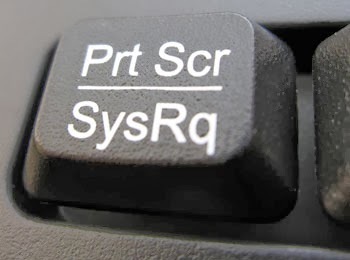 If you are using Windows XP and above, simply clicking on the the PrtScr (Print Screen) key captures a crisp image of the entire screen to the clipboard. Look for this forgotten key at the top-right area of the keyboard. On different keyboards the key label might be PrSc, Prt Scn, etc. Now that the image is in the clipboard, you can paste it inside various applications, such as a Word document or a PowerPoint presentation. You can even paste it into the rather antiquated Paint application. Pasting the image to a PowerPoint slide is probably the most useful, since you can right click on the just-pasted image and select Save as Picture to export the screenshot to an image file in various formats (JPG, GIF, PNG, etc). You can also use PowerPoint’s photo editing capabilities (crop, resize) to edit the image before saving. Tip: If you need to capture only the active window, as is often the case, clicking Alt-PrtScr (holding the Alt key while clicking PrtScr) will do the trick. Want to capture a witty SMS exchange and turn it into an image? It’s easy to take snapshots of your smartphone’s screen if you know the right key combination. On Apple gadgets, simply click on the round Home button together with the Lock button. You will hear a click, and a screenshot will be saved to your Camera Roll (iPhone) or Saved Photos (iPad, iPod). Android users have it a bit more difficult. On most phones running Android 4 you will need to press the Volume Down key together with the Power key, then hold for about 5 seconds. Not easy for people with small hands! You will then hear a click and the screenshot will be saved to the Screenshots folder, which you can view (and share) with the Gallery app. On some Samsung phones, the Power+Home keys does the trick. If neither of these work on your phone, your best bet is to check the user’s manual or to Google it. The Snipping Tool is a great tool that makes it easy to take a snapshot of any area of the screen. The tool is automatically available to the lucky users of Windows Vista, Windows 8, and certain versions of Windows 7 (Home Premium and above). To run, simply click the Start button, then start typing Snipping Tool.